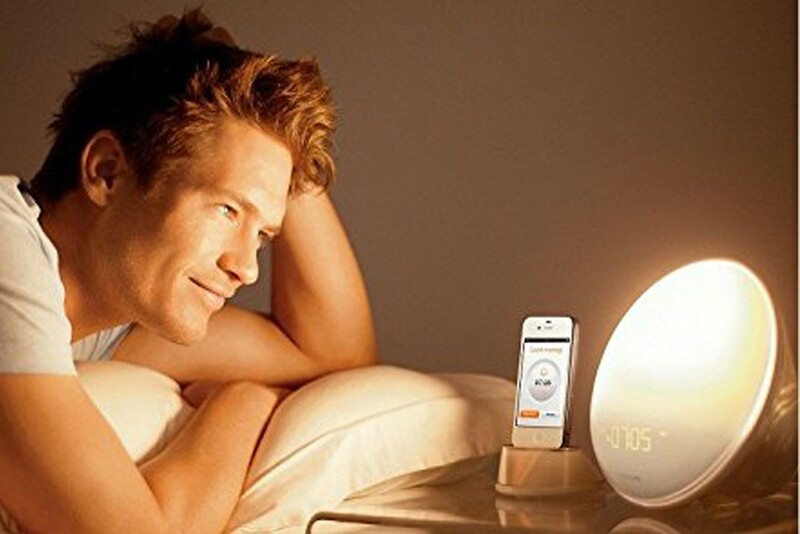 Summary: A stylish wake up light from Philips that allows you to connect your iPhone to it so you can wake up to your chosen music on your phone. Easy to set up the alarm using the free app that comes with the device which you install on your phone. 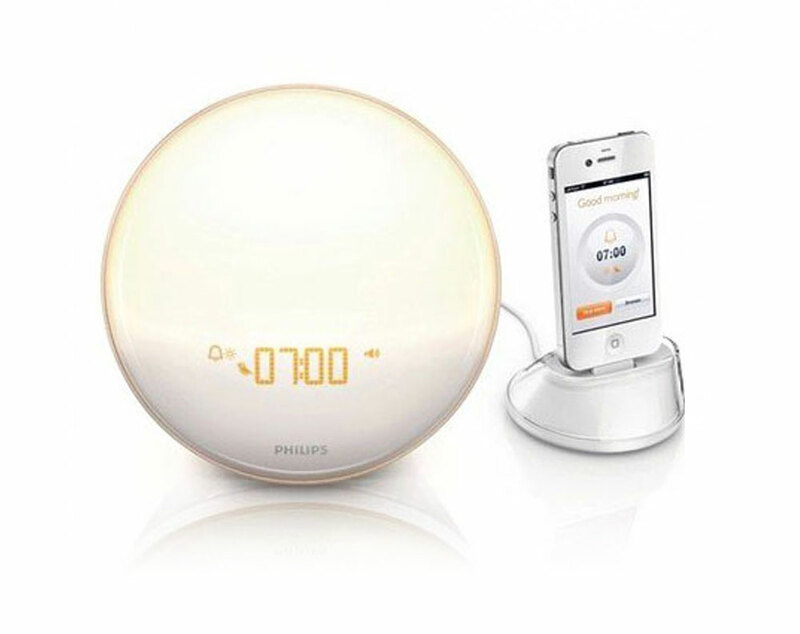 The Philips Wake-up Light HF3550 is based on the top of the range design by Philips in their sunrise alarm set, in terms of spec and design it is very similar to the Philips Wake-Up Light Alarm Clock HF3510/01 that we reviewed here. Now although the design and features are the same there is one big difference, this model works through your phone. Now when I say phone I’m going to have to be a lot more specific, as it is really just the older models of the iPhone, from the iPhone 4 and older. iPhone Dock included, this model allows you to connect up your iPhone, this will charge it in the night, but also allows you to play music through your phone in the morning and be gently awoken to a track of your choice if you choose. Set up with your Phone – Using your iPhone you can download the Philips Wake-up app from the iTunes store, the app itself looks good and is easy to use, here you can set your alarm, select one of the 8 natural sounds to wake up with or a song from your music library on your phone. You can also adjust how you fall asleep with the dimming light and music as well as tracking your bedtime routines and monitor your sleep behavior of the past week. Snooze just tap anywhere on the device and put your alarm on snooze, a standard feature now a days but designed well that all you have to do is hit the light, no small clunky buttons to press. This model is designed for the iPhone 4 and models below. This is because the connector on the device is the old 16 pin connector that will work with these iPhones. If you have a newer iPhone such as the iPhone 5 and higher then you can still use this, however you will need to purchase an Apple iPod Lightning to 30-PIN Adapter-ZML which will convert the plug to an Apple lighting plug. Using this will make your phone stand up higher. As your phone is connected to the alarm is allows you to select music on your phone to wake up to, you can still select from 3 different natural wake up sounds. You can download a free Philips app that will allow you to control and set up the Wake-up Light HF3550. This is quick and easy and the app is simple to use, like any other phone app. It also gives you an easy to view user interface and saves you having to set it up using the buttons on the alarm itself like the other models. Although the app looks good and is easy to use there have been poor reviews left for it, the app is still being updated at the time writing. The app functions this clock, so without your phone and your app you cannot use the alarm on this, so it is worth noting that if you uprooted or change your phone, then you could have a large but stylish paperweight. The design of the light is beautiful and looks great, the phone stand that it comes with is stylish and is separate to the alarm itself, there is a wire that plugs into the back of there alarm to connect the phone up. Phone and App needed to set alarm, otherwise not possible to use. As with all Phillips wake up lights it looks great and follows their stylish design and look. This model allows you to connect up your iPhone to it, this is great as you can wake up to tracks on your phone, easily set the alarm and also charge it through the night too. However the drawbacks are that it only works with phones that have the old 30pin connecter (Apple adaptor needed for newer iPhones), it is designed just for iPhones and you can only set the alarm with the app on your phone, so if you lose your phone or don’t have it one night, then you cannot use the alarm light.